NLN Press proudly presents the newest publication in the Voices series . 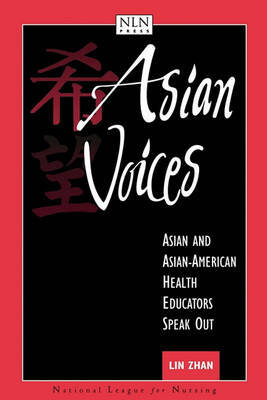 Here Asian and Asian American health educators discuss the implicati ons of cultural factors in providing health services to Asian and Asia n American communities. They also explore multiple issues concerning A sian American's health: health promotion and disease prevention in eld erly Chinese American women, the implications of Japanese health care, HIV/AIDS in Asian Americans, Buddhist ethics and implications for end -of-life issues, the dilemma in searching for health care, traditional Chinese medicines, Korean women's health, and much more.